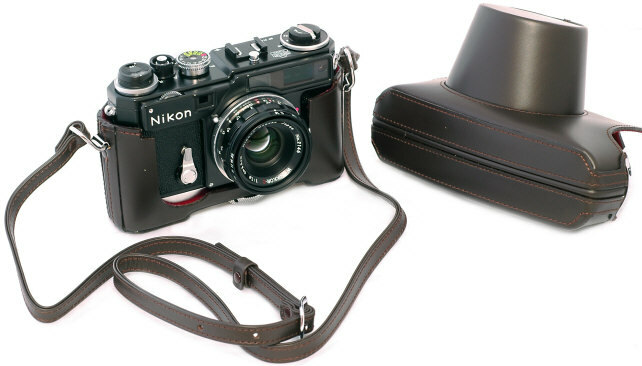 The limited edition black Nikon SP 2005 is a reproduction of the original 1957 Nikon SP except for minor details. Officially Sold only in Japan, now sold out at the factory. 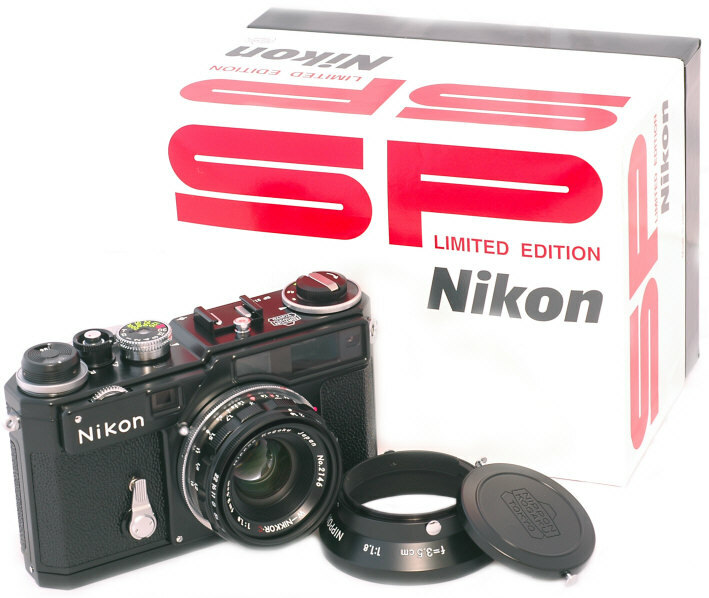 Originally the SP 2005 was sold directly to the Japanese public, bypassing the Nikon dealer network thru a lottery system. When the lottery did produce a sell out, the remaining cameras were quickly sold out thru the home market Japanese Nikon dealer network. It is my understanding no SP 2005 were officially exported outside of Japan by Nikon. Nikon rocked the Nikon collector's world January 14th 2005 by announcing a new 2005 production of the fabled and Nikon's collector favorite BLACK SP with 35/1.8 !! I am told the factory sold out by May. To serious Nikon collectors, this is like winning the lottery! The factory sold out in May 2005. This probably means future appreciation and forlorn Nikon collector stories of the whopper that got away: "I can't believe I had a chance to buy a new Black Nikon SP, and didn't do it!" 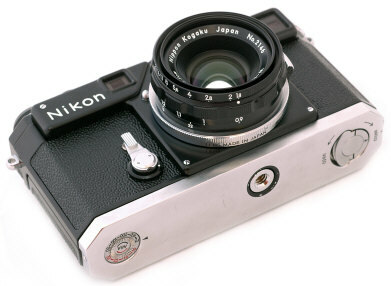 Nikon originally discontinued rangefinders in 1964. 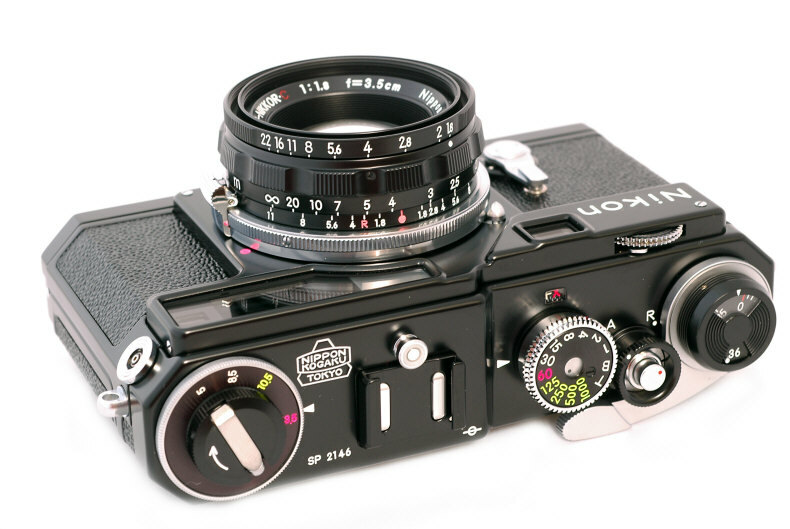 In 2000 Nikon stunned the rangefinder world with a reproduction of the 1957 Nikon S3. 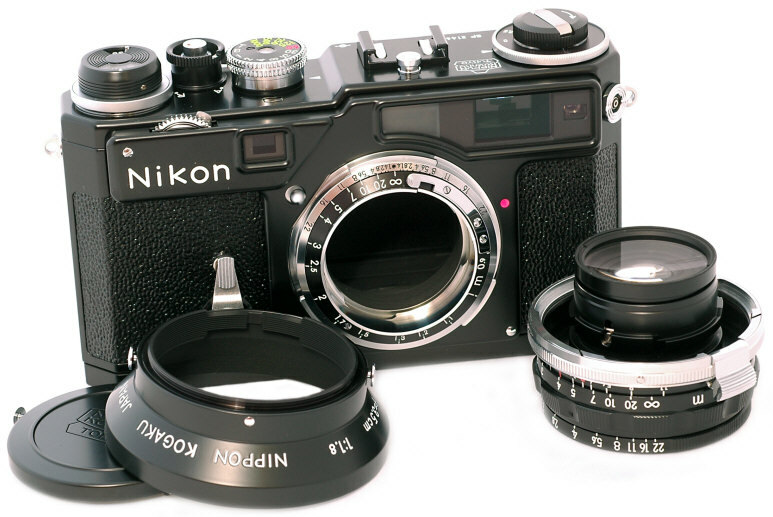 Five years later Nikon amazed collectors more as the ultimate film Nikon was once more introduced just as most other camera manufacturers were cutting back film cameras to concentrate on digital. The 2005 35/1.8 Nikkor is identical to the super rare original 1956 all black 35/1.8 Nikkor, except for modern multi-coating and the special four digit serial number. 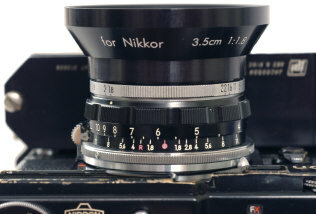 The original 35/1.8 Nikkor has a six digit serial number starting with 35. All except the first 100 or so have a chrome aperture ring with black f/stop lettering. 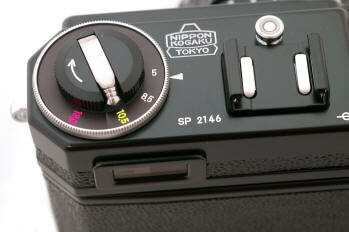 Just like the original Nikon rangefinders, the back of the SP 2005 removes for film loading. The film advance spindle also has the motor lug for the extremely hard to find Nikon SP motordrive, the first professional quality motor drive for 35mm photography. To mount the motor, you need the motor and the motor plate which replaces the inside bottom plate of the SP, and you have to have a repairman adjust the motor to that body. The original SP has a ASA film speed reminder. The SP 2005 has a ISO film speed reminder. The SP 2005 has a back marked "Made In Japan" near the tripod socket. The original SP has "Japan" marked on the chrome back latch. The original Nikon SP's have a 7 digital serial number starting with 62. The SP 2005 has a four digit number starting with SP. The fit and finish of the SP 2005 is amazingly every bit as good as the original -- a miracle considering Nikon had to re-tool for the SP and create a new hand assembled SP production line. Nikon did not produce body cap or rear lens cap for the SP 2005. Thankfully the Voigtlander body cap for the Voigtlander R2S and the rear cap for the SC series of Voigtlander lenses work nicely. 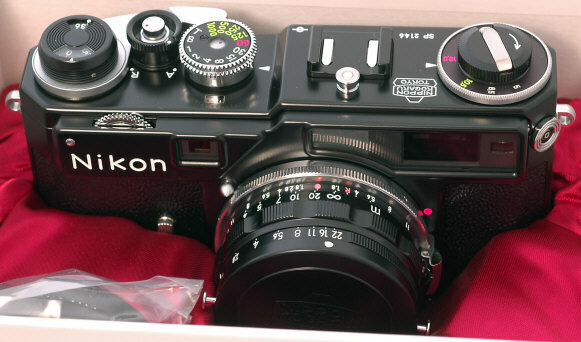 Unlike the SP 2005, no vintage black Nikon SP is believed to have left the factory with a chrome self timer. As many owners of near mint vintage SP's have discovered, new backs are virtually unobtainable. This is also true for the S3 2000 and SP 2005 because Nikon does NOT sell parts for these cameras easily. If you plan to shoot your SP 2005, do yourself a HUGE favor and either always leave the bottom of the case on, or shoot with a substitute camera back so not as to mar the practically impossible to obtain original back. Luckily the back from the relatively inexpensive Nikon S2 will fit your SP, though the reverse is not true. Take note that although vintage S3's and SP's backs are completely interchangeable with the newer S3 2000 and the SP 2005 backs, the vintage and later edition backs are not identical. SP 2005 in its 2005 camera case. Notice the large snout, the same case made for the S3 2000 with its relatively large 50/1.4 Olympic Nikkor copy. Tom Abrahamsson's replacement 35/1.8 lens shade. You DON'T want to see your original 35/1.8 lens shade pop off to go down a storm drain or into deep water! Tom's shade mount on a vintage chrome aperture ring 35/1.8 Nikkor, on a vintage black SP mounting the fabled SP S36 motor and much rarer cordless S36 Jacobson battery pack. 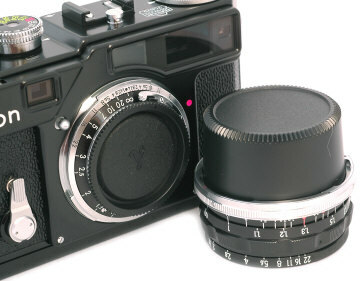 Likewise, use the Voigtlander 43mm snap on lens cap instead the original Nikkor lens cap! I find Nikon's timing on the SP 2005 really interesting. When most other camera companies are discontinuing film cameras left and right, Nikon arguably the most advance 35mm film SLR ever at Photokina 2004 in the Nikon F6, only to follow it up three months later by astonishing the 35mm world with the SP 2005. Now Nikon is paying a homage to its past with the new Black Nikon SP. Personally I see the F6 and new SP cameras as a very classy move by Nikon management. 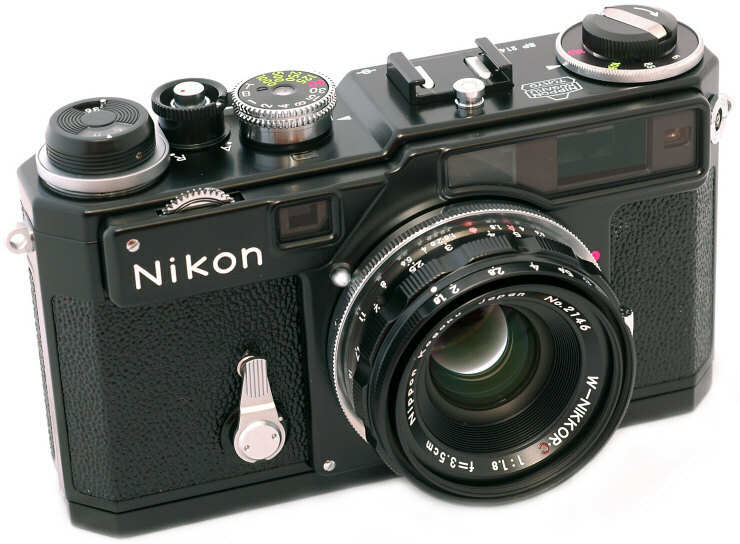 Just as many people are writing off film, it Nikon is producing some of the best 35mm film cameras ever. The Nikon company arguably has a "camera soul" -- something which is very hard to imagine with most "damn our tradition, make the most money" camera makers. 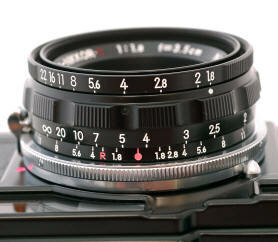 SP owners would do well to have at least one user Nikon F for parts. IF the cloth shutter curtains ever give way, have them replaced with the indestructible titanium shutter curtains from the Nikon F. Take note Nikon could have made the SP 2005 identical in all respects to the vintage SP. Apparently small differences were introduced to allow Nikon nuts to tell the difference between the vintage and new 2005 camera and lens. The SP 2005 has both electronic flash and flash bulb synchronization just like the original, making the SP 2005 is an excellent candidate to be Nikon's last camera synchronized for flash bulbs! Nikon really did this camera right. Nikon fans and Nikon employees can be very proud. This is the real deal. Owning a SP 2005 is owning part of photography's history and heritage. IF you are one of the lucky owners, I hope you take the responsibility seriously and take care of the camera so that it will eventually pass on to its next owner in good condition. From the day the SP 2005 left the Nikon factory it deserved to be in a museum, but it also deserves to be shooting film and showing the world what the best of 35mm photography once offered. The 2005 has an improved brighter viewfinder and rangefinder. The difference is not huge, but I believe it is there. 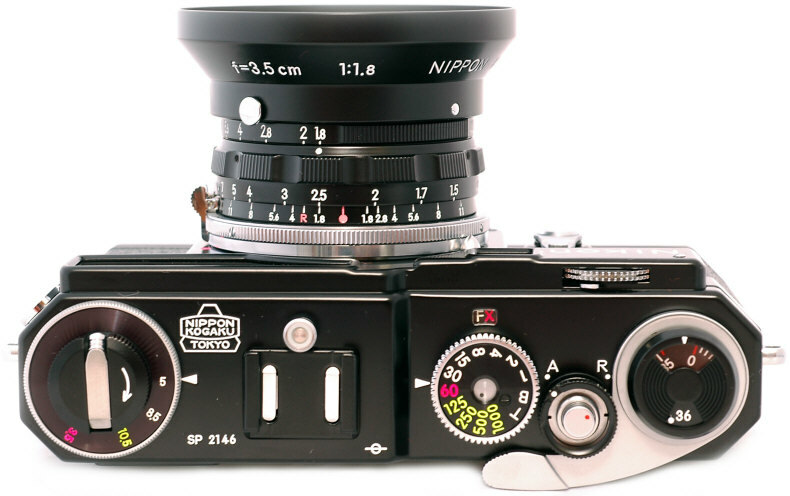 The SP 2005 gets my own vote as the best shooting Nikon rangefinder. I find this finder much preferable to the also retro recreated Nikon S3 2000. 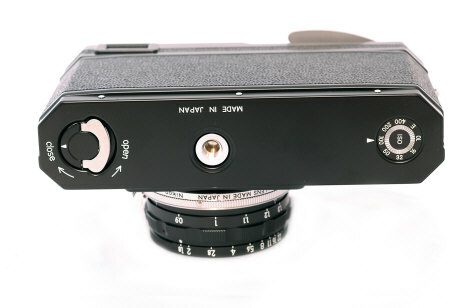 Originally 22,348 Nikon SP's were produced from 1957 to 1962. The vast majority were chrome. Only about 2,000 were made in what was considered the professional black paint finish. The 2500 SP 2005 are only made in a faithful reproduction of the beautiful black paint finish. The 2005 is only made with cloth shutter curtains. Vintage SP's originally had cloth curtains, but later used titanium curtains which were interchangeable with concurrently produced Nikon F SLR. It would probably be a good idea for SP 2005 owners to have at least one Nikon F, for the distant day when your cloth shutter curtains need replacement. 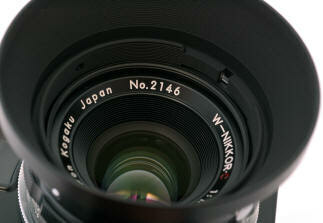 The 2005 35/1.8 Nikkor lens is multi-coated instead of single coated like the original. 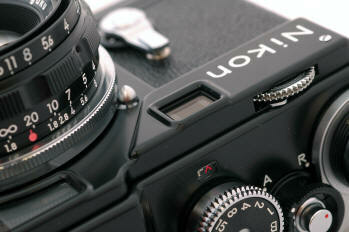 The 2005 has the late Nikon F style advance lever. 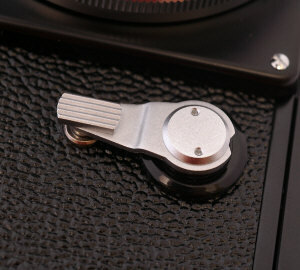 Vintage SP's used a smaller advance lever which then changed to the F style in late production. This is a list of differences I noted between these particular cameras. Since there were small differences during the production run of the original SP, this list is not represented as being complete --- or even consistent with all original black SP's. Revised: September 12, 2017 . Copyright © 2006 Stephen Gandy. All rights reserved. This means you may NOT copy and re-use the text or the pictures in ANY other internet or printed publication of ANY kind. Information in this document is subject to change without notice. Other products and companies referred to herein are trademarks or registered trademarks of their respective companies or mark holders.